Can Kenya's Maasai swap cows for bees? Some Maasai herders in Kenya's Rift Valley have turned to beekeeping after years of drought have left hundreds of their livestock dead. The bee project has become a lifeline to communities known for the importance they have attached to their cattle for many generations. "Although we lost many cows, beekeeping has enabled us to make money and buy food for our children and send them to school,'' says Jane Karrinkai. Forty-two-year-old Larinkoi Ole Kone is equally excited by the change in his fortunes, after he lost 69 cows. He has invested his beekeeping money in buying some goats and has also used some to pay school fees. The idea of the Maasai even contemplating life without their cows, let alone expressing happiness about it, is hard to fathom for many other Kenyans. 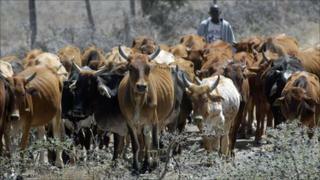 Some Maasai communities have been known to opt for starvation rather than slaughter their cattle. But Kenny Matampash, the man behind the beekeeping initiative, says the bad drought four years ago left the Maasai in Kajiado District with little option but to diversify. "We lost over 70% of cattle due to drought. That's a lot to Maasai," he says. Now the honey from the Maasai hives is not only sold in Kajiado and its environs - but also some 100km (60 miles) north in the capital, Nairobi. They also have plans to export the honey which they harvest twice a year. When the hives were initially started, the honey harvesters had to brave the angry bees without any protective clothing. "They used to go there very early in the morning, naked,'' explains Johnson Kuntayo, one of the Maasai involved in beekeeping. "The bees at that time cannot see the harvester properly but they still sting his hands when going for the honey. But the Maasai honey harvesters do face some stiff competition - from mongooses. They say that the mongooses raid the beehives at night and eat all the honey. It is believed locally they do this by farting - although animal behaviourists say they are not known to be particularly flatulent animals. "The mongooses are very clever animals. They normally climb up the trees where the beehives are," says Mr Matampash, who runs Neighbours Initiative Alliance, a non-governmental organisation backing the beekeepers. "Once up there, they break wind - forcing the bees to flee from the foul smell and then they knock down the beehive and eat the honey. "We cannot kill the mongooses since they have a right to survive but we're devising ways to contain them. However, the problem with the mongooses has not hampered the enthusiasm of Mr Matampash and his team which have now involved more than 600 Maasai in 31 community groups in honey harvesting. "The project started in a small way. Now have given over 400 modern beehives to neighbourhoods within the area," he says. As well as weaning the Maasai from their dependency on cows, beekeeping has had other cultural implications. "Most of the beekeepers and harvesters are now women. They also sell the honey," says Mr Matampash. The hives have also been beneficial to the Maasai by conserving the environment. Fewer trees are being cut down these days as they are used for the beehives. Despite its success, however, beekeeping has not dampened the desire of Maasai to buy more cows. Mr Matampash says it is very difficult to convince the Maasai to live without cows. "No matter how many cows die, they'll still buy cows with the money they get from beekeeping."